There is a YAK52-TW version. It is actually a tail dragger which hides comepletely its main wheels inside the wings. Is by any chance something that ED might consider to adapt? Q: What language will the cockpit be in on release? A: Currently we have a Russian. English & Chinese versions are WIP. Any news about a complete English cockpit? A lot of the instruments are still in Russian. If you can't read that (like me), it's quite hard to know at a glance, at which instrument to look at. Last edited by norbot; 09-27-2018 at 10:42 AM. Is there a timeline for a damage model? I'd like to use this as a FAC and mark targets with the smoke pod? Also could we get some generic skins for other countries other than bare metal? I know I can download them but for multiplayer use. Thanks. What are the next steps implementing missing things? Would like to have a working ARK instrument to do some NDB nav training flights. Q: Will there be new features in the ME and mission flow to allow for training/"civilian" missions? ARMAMENT: Ground attack variant can sport: 2 x 32-shot UB-32-57 rocket pods, 2x GUV-8700 (9A669) gun pod, 2x UPK-23-250 gun pod. 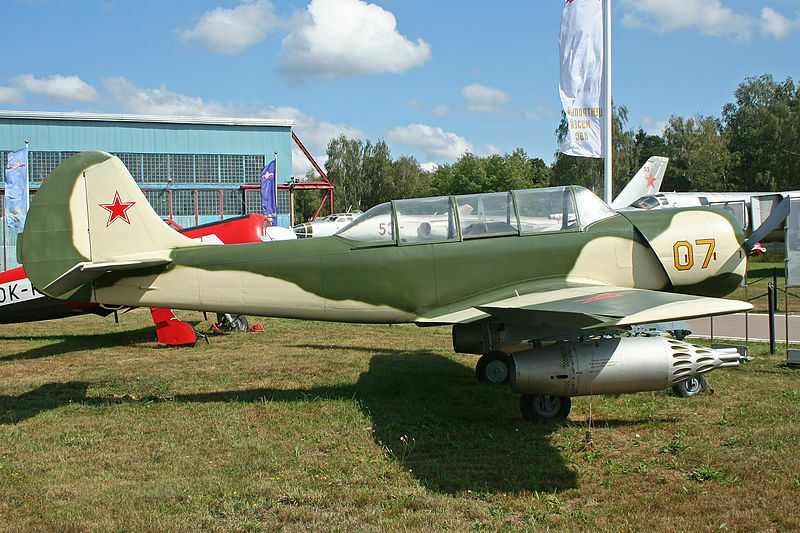 Why not include the Yak-52B version in the Yak-52 module, there are so many people who want it? Is it so hard to code a "Master Arms On" and I push the trigger and it fires rockets? Last edited by Satarosa; 01-04-2019 at 04:51 PM. how come the rocket pod doesnt have a shadow?? The drag needs to be modelled as well and the FM as well as other things.. I'd say the pod's shadow is just underneath it. The shadow of the front fuselage is obstructed by the pod, so we can't see it. Sun is shining from the upper right direction in the image.